“God be with you,” is his reply. “It’s our democratic right to express our beliefs. It’s freedom of peaceful assembly and freedom of religion,” Pawlowski says. Pawlowski says that he “wants to pray for the wisdom of city hall politicians,” and the best place to do that is in the atrium at city hall. “City Hall is considered to be an office building,” says Paul Tolley, solicitor with the city. “People need to apply for permits and receive permission to hold events inside the atrium of city hall,” he says. But for Pawlowski, praying outside business hours is not an option. He says he wants a place to pray during public hours, saying that “people should be able to pray for the politicians and their decisions,” even if that means having a secluded room where people could pray. Pawlowski says it is his right as a citizen to pray in a public space, however, the idea of “public space,” and what can and cannot take place within it, is not so cut and dry. 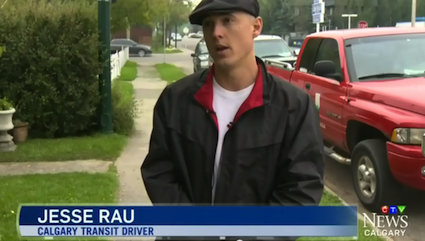 Justin Jalea, an instructor of Religious Studies at Mount Royal University, says that as long as Pawlowski is not breaking any laws, he should be able to “profess his faith in public spaces” — though the public also has the right to respond to his actions. 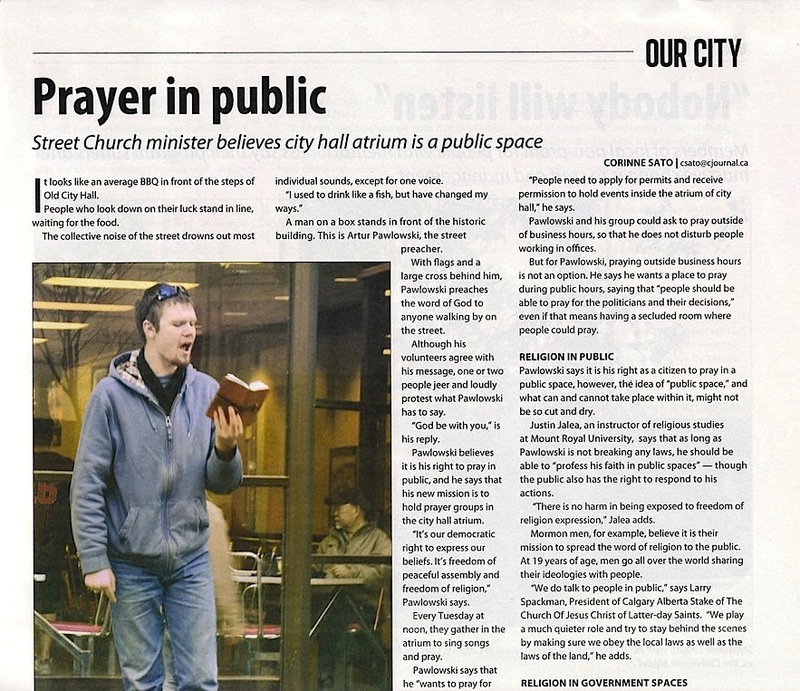 preacherstreet-fbShould street preachers be allowed to pray inside of city hall? Photo by Melissa Molloy “There is no harm in being exposed to freedom of religion expression,” Jalea adds. “We do talk to people in public,” says Larry Spackman, President of Calgary Stake of The Church Of Jesus Christ of Latter-day Saints. “We play a much quieter role and try to stay behind the scenes by making sure we obey the local laws as well as the laws of the land,” he adds. “We have to think differently about certain places and spaces,” says Jalea. He says that government buildings should be free of religion, in order to be fair, equal and show respect to everyone. “We believe the state should not support any particular religion,” Spackman says of Mormonism. For Jalea, this space for prayer in city hall doesn’t sound quite like what the Canadian Charter means when it comes to freedom of religion. “Artur has other places where he can express his religion and his fundamental rights, and his rights are not being supressed,” Jalea says.